Learn the four things you must do to position your WordPress agency or freelance business as the only choice for ideal clients, so you practically close the sale before speaking with a prospective client on a sales call. When I quit my full-time job as a designer to start freelancing, I had a huge mortgage to pay and a baby on the way, and I needed clients fast. This was before the days of Dribbble, portfolio sites, business blogging, and social media, so that meant meticulously mounting my work on 16×20” black matte boards and hauling them around with me in a fancy case as I traveled from agency to agency pitching my work and doing what I call the freelance dog and pony show in an effort to persuade others to hire me. Pitching my freelance work was exhausting, frustrating, and demeaning. The effort it took to convince an indifferent decision-maker of my worth was arduous and sitting in a waiting area with other freelancers I was competing against was disheartening. Thankfully the work came and in my first full year of business, I earned well over six figures and over the next few years, as I learned more about running a freelance business, building a brand, leveraging marketing tactics, and closing sales, I decided that I hated the dog and pony show. I knew there had to be a better way. So, I took a step back to evaluate my message, assess how I was showing up in the marketplace, and clarify who I wanted to work with. Then I changed my entire approach to branding, marketing, and sales to become the only choice in the eyes of my ideal clients and not just another choice. Today, by the time a legitimate prospect completes Bourn Creative’s project inquiry form, most have already decided that our agency is the best choice and that they want to work with us. We don’t have to do anything to convince the prospect of our value and worth. Instead, our inquiry form follow up and adds value, affirms their decision to reach out, and practically seals the deal, and the sales call becomes about making sure both parties like each other, confirming the project is a good fit and discussing next steps to start the project — not about convincing the prospect we are worthy of their investment. 1. Awareness: an understanding that there is a problem and looking for a solution. During the awareness stage, you must deliver content that helps the buyer get to know you. Help them discover what you do, how you can help, who you serve, and why you’re the best choice. Awareness content is all educating the buyer about what they need and helping them discover potential solutions. 2. Consideration: the contemplation of options and narrowing of choices. During the consideration stage, you must deliver content that helps the buyer figure out if they like you. Help them determine if they like your work, what you have to say, your perspective, and how you present yourself. Consideration content is all about connecting with the buyer, positioning your solutions, and helping them figure out the best course of action. 3. Decision: the confirmation of choice. During the decision stage, you must deliver content that helps the buyer conclude that you are trustworthy and the right choice. Help them verify that you are the credible expert you claim to be, that you have successfully helped others before them, and that you have the capability to solve their problem. Decision content is all about confirming choice and moving them to take action. To this point, your website content and marketing content has helped the prospect identify themselves as an ideal client, and get to know you, like you, and trust you, effectively cementing your reputation as an industry authority. Now it’s all about guiding the prospect to a conversion — the next logical step. Invite the prospect to contact you about their project through a lead inquiry form on your website or to reach out directly by phone or email. Make it as easy as possible for them to take action. Once a prospect has completed and submitted your project inquiry form, they are a hot lead and the sale is yours to lose. 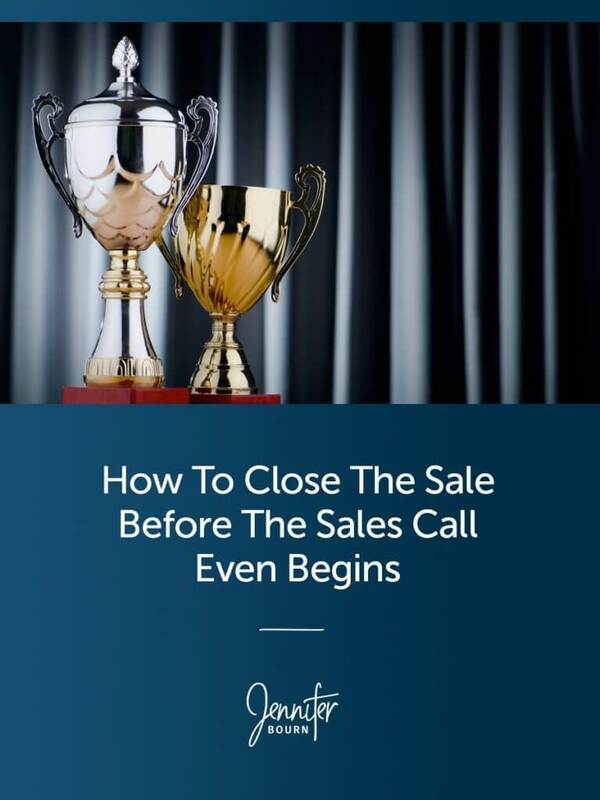 To seal the deal and practically close the sale before you even host a sales call, follow up with the prospect right away. Investing in the creation of a new project inquiry follow up system demonstrates your professionalism and solidifies your position as an industry authority in the eyes of your prospect. It also adds unexpected value to for your prospect which will basically make the prospect fall in love with you and see you as the obvious only choice. In Profitable Project Plan, my client management course for freelance designers and developers and small agencies, I teach the core framework for a Sales-Free Sales Call. It walks step-by-step through an entire sales call, covering what to ask, what to say, and in what order to say it, as well as how to host the call without being salesy and pushing your services. While the Sales-Free Sales Call Framework is highly successful in closing new sales on its own, the entire sales call process really becomes practically effortless when the prospect comes to the call enamored with you and already ready to buy. Once again, in this case, the sales call is no longer about sales, but about connecting with the prospect, making sure you will enjoy working together, confirming the project is a great fit, and discussing the next steps to get started. With this approach, you’ll go from being another choice to being the only choice in no time!